LILLIPUT LANE CEASED ALL PRODUCTION IN AUGUST 2016. STOCK IS LIMITED. ALL SALES ARE FINALE. 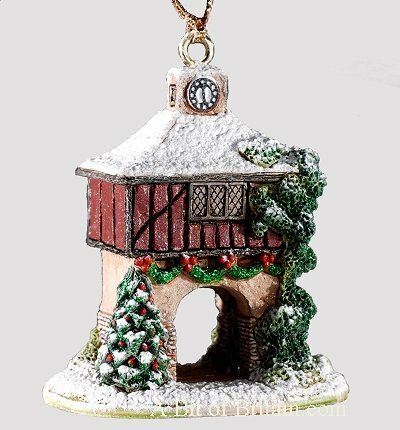 Our latest Christmas Hanging Ornament has been inspired by the entrance bay of the gatehouse to Ingatestone Hall, built in the sixteenth century by Sir William Petre, a wealthy Devon tanner and courtier to Henry VIII, who purchased the estate from Barking Abbey during the Dissolution of the Monasteries. Although the house was built in the mid-sixteenth century, it was in the eighteenth century that the Ninth Lord Petre made some alterations, and it is at this point that the unusually ornate one-handed clock first appeared, with the French inscription 'Sans Dieu Rien', meaning: 'Without God Nothing'. With its colourful red brickwork, semi-elliptical archway, jettied upper storey, and pyramidal roof of handmade red clay tiles, topped with clock tower and bell turret, it is the perfect addition to our collection of ornaments, so why not celebrate 'festive times' by placing a fairylight on your tree behind the archway to really capture the light! 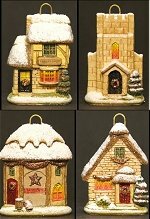 Lilliput Lane flate ornament set. Guaranteed to add charm to your Christmas tree this year and forever! Easier to hang that he cottage ornaments. But we know that you won't want to just keep them for yourself, so these four delightfully festive little architectural gems come in a window box ready for giving!